Categories: cooking	Tags: bouzouki, cheese, cooking, feta, filo, food, Greece, greek, phyllo, spanakopita, spinach, tutorial. 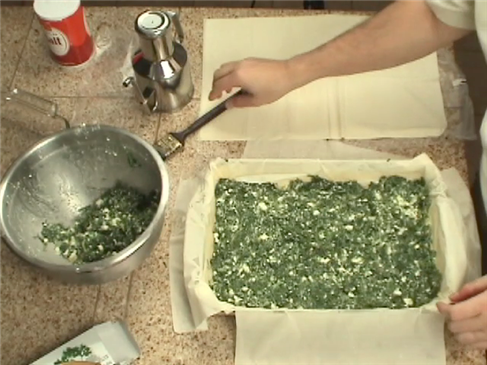 I’ve been making spanakopita for years. I finally decided to make a video tutorial on it. This is the only way my kids will eat spinach. They love it! I know that you’re suppose to roll your own phyllo but I simply don’t have that much time. The whole thing took about an hour to make and about 40 minutes in the oven. 2.5 lbs spinach, 5 green onions, 11oz feta cheese, 2 eggs, 2tbsp fresh parsley, 1 tbsp fresh dill, about 10 phyllo pastry sheets, half cup olive oil. Note: You don’t really need to add eggs if you don’t want to. It will still taste just fine.